To help you in this task we are going to share with you some fantastic deer jerky recipes in the below article that you can quickly cook in your food dehydrator without much hassle. All of them are up-to-date. We have also shared some useful info related to the deer jerky recipes that will surely make you more attentive and aware of the same. So, get ready and gather all your ingredients along with the dehydrator and start preparing some yummy recipes quickly! What is the nutritional value of the Dehydrated Deer Jerky? Before telling you about the nutritional value of the dehydrated deer jerky, let’s talk briefly about the food itself! Deer jerky is a dried and lightweight snack which is quite handy for the outdoor sports enthusiasts, campers as well as backpackers. It does not require any refrigeration. You can quickly prepare it at your home in a food dehydrator. Kids also love eating this as a snack. 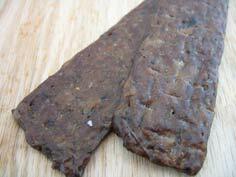 It is an amazing deer jerky recipe in which you can use either deer or beef. One of the healthy ingredients that used in this recipe is apple cider vinegar that is not only nutritious but adds incredible taste to the recipe in the end. The garlic powder and black pepper make it little spicy. 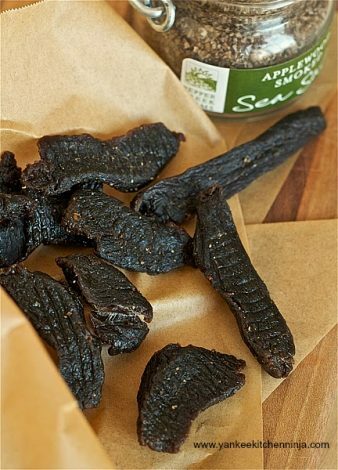 It is a classic recipe of the deer jerky that comprises of double dosage of the spicy flavor of pepper from both, i.e., coarsely minced peppercorns over the top and broken peppercorns inside the recipe’s marinade. This deer jerky recipe comprises of a tiny proportion of all the things to create a sweet and robust tasting deer jerky. Go forward and use a blender for getting the molasses and brown mixed perfectly. 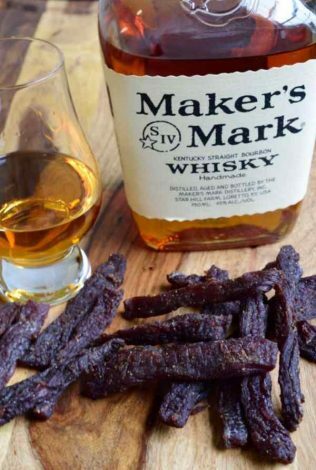 All those deer jerky lovers who like the meat and bourbon will surely love this recipe. The recipe of the deer jerky possesses a delicious marinade. However, the blending of the spices results into a zesty heat. You can make it in a dehydrator and oven both. Some people found it very addicting. The use of teriyaki sauce and extra-tenderizing Worcestershire sauce add up more flavor to the recipe. The king ingredient of this recipe is adobo which is generally smoked jalapenos that preserved in a spicy and rich adobo sauce. It might sound something mysterious to you. What you can buy the can easily from the market. 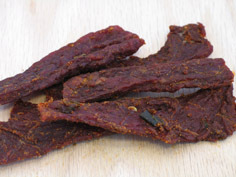 The recipe comprises of slightly thick and chewy deer jerky along with the flavor of the spicy BBQ in the end. You will surely can’t resist yourself from taking another bite of this recipe. It is an easy recipe of the deer jerky that you can make at home with the simple ingredients like Tender Quick curing mix, onions, garlic, corn syrup, and black pepper. People who don’t like to do much experiment in the recipes will go to love this recipe for sure. All the ingredients add more nutritional value to the food. It is fast and easy to prepare recipe which gratifies the requirement for a safe and healthy snack. You need some common ingredients for making this recipe like cayenne pepper, ground cardamom, curing salt, garlic powder, pepper, etc. All these things are readily available at home, and you don’t have to rush immediately to the market. It will provide you with a taste that you can’t forget. The deer jerky along with the pepper, hot pepper sauce, and barbeque seasoning. It consists of spicy and healthy ingredients that well enhanced the flavor in the end. All the above recipes in the article are quite delicious in flavors. But if you ignore a few essential tips then, this can affect the result of your recipe. Have a look at some useful tips for making deer jerky! Always cut and slice the deer jerky evenly either with a knife or a cutter. 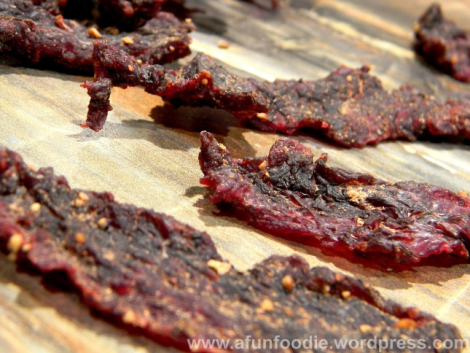 So, here we reach the end of our article of deer jerky recipes for the dehydrator! All the above recipe are different from each other. They have different ingredients, different flavors, seasonings, spices and different preparation time. But there is one thing that is common in all of them, i.e., deer jerky. 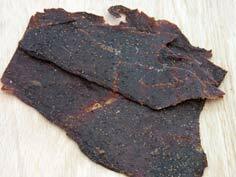 The dried deer jerky is a favorite snack for lots of people around the world. It is not only nutritious but delicious too. 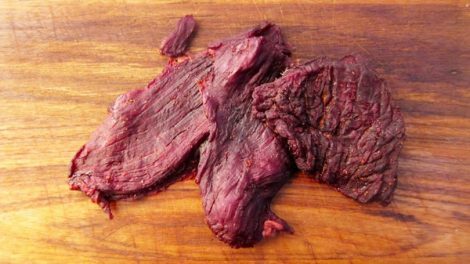 The deer jerky recipe prepared at home is a far better and healthiest option than the store-bought deer jerky. There is no use of extra salt, oil or chemicals in these recipes. So, what are you waiting for now? Pick one of the tasty deer jerky recipes from the above list and start preparing it for your family and friends. You can also include it in the menu list of your party. We are sure anybody who eats this recipe will surely going to ask you about this recipe once. Don’t forget to share any deer jerky recipe that you have here in the below comment box. Feel free to share this article with more and more people.